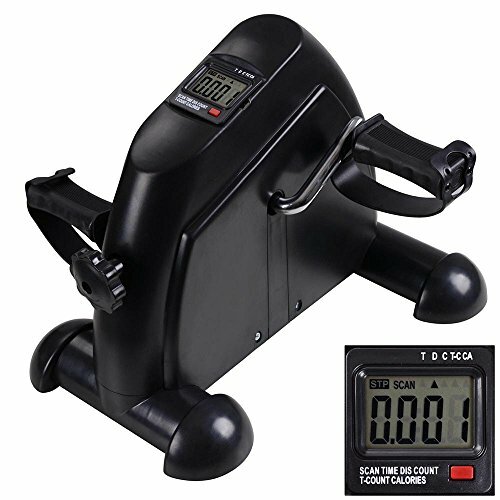 You are viewing the Pedal Exerciser Mini Cycle Fitness Exercise Bike. It's a portable machine that is suitable for upper and lower body exercise, especially for arms and legs exercises. With its stable frame and non-slip feet, you can enjoy your exercise while you are playing computer, watching TV or at work. Also, there is a resistance knob which could adjust the strap resistance according to your physical strength. Besides, it has a multi functions LCD display that will change automatically after a couple of seconds, then you can keep track of the time, distance, number of exercises and the total estimated calories consumption. This pedal exercise is ideal for users of all ages and beneficial for improving cardiovascular function, promoting the blood circulation, etc. Ideal for all ages & beneficial for improving cardiovascular function, promoting blood circulation, etc.